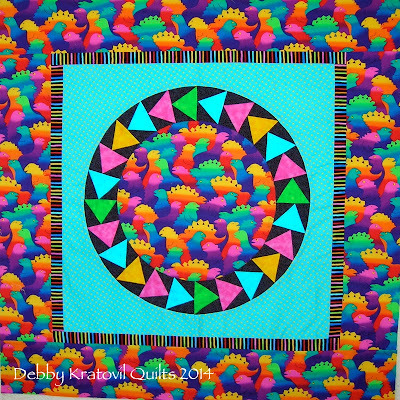 I began making circles of Flying Geese several years ago using my own paper pieced patterns. 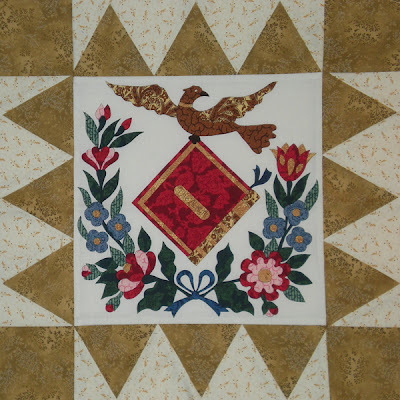 And then made them into quilts which also became options for my book "Paper Piecing Perfect Points." 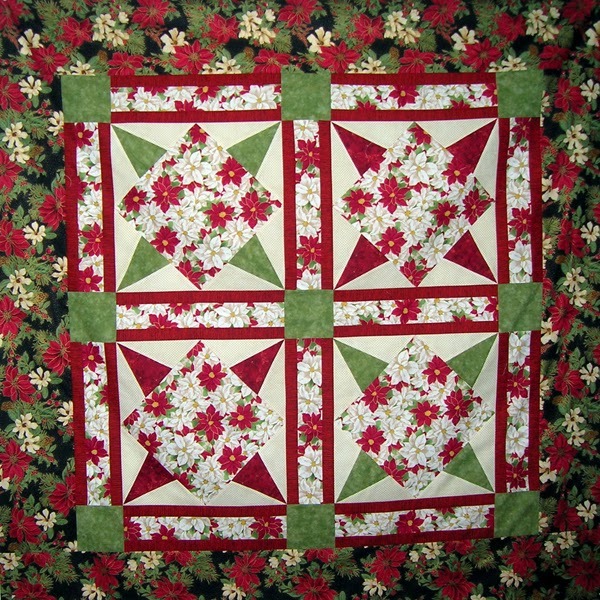 My publisher only chose one, the above quilt not on that list. 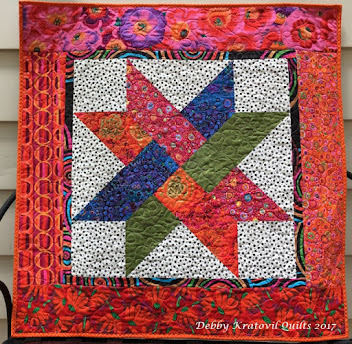 But I love this quilt because of the various fabric textures (especially the wild circles/bullseye fabrics in the center). The publisher didn't want this one, either. Sigh. But here is the one they chose for the book. I made this several years ago and fussy cut a lovely toile for the center and then again for the four corners in the border. 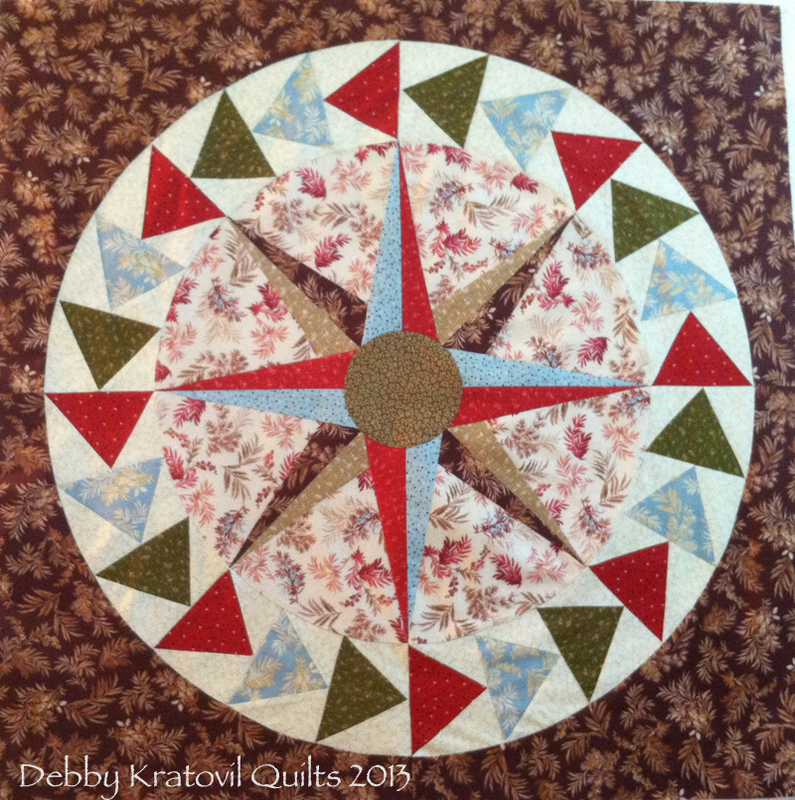 And here is a variation of this ring of geese which I made to add to a large Mariner's Compass. 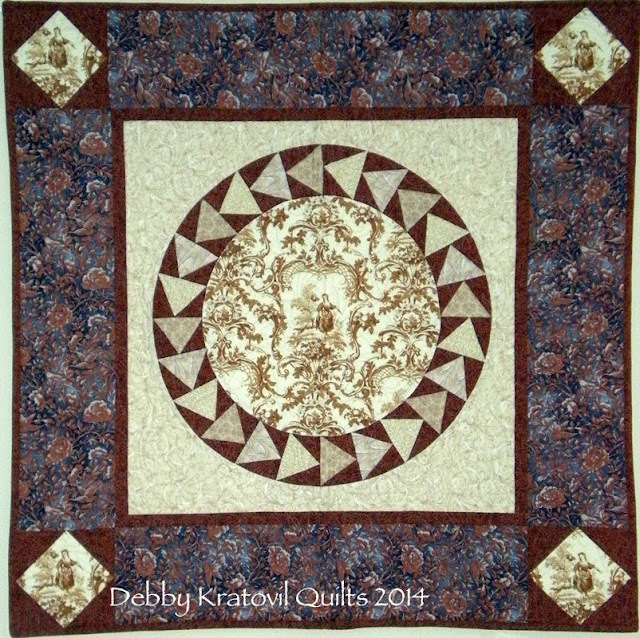 I upsized the whole thing and, yes: this was paper pieced on a very LARGE coffee filter! And here is what I made for the Nancy Drew Blog Hop a few months ago. Same Geese Ring, new center. Don't you just love it? As I was looking at the quilts on my wall this morning, in the quiet of the early hours, I realized that I was gazing at a few of my Christmas quilts. 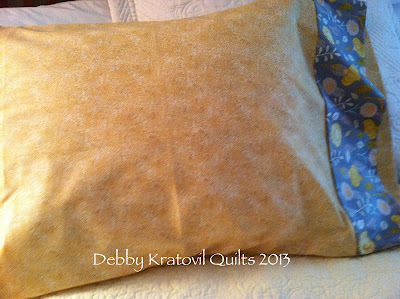 The one pictured above is called Diadem because, well, that's the name of the traditional block! 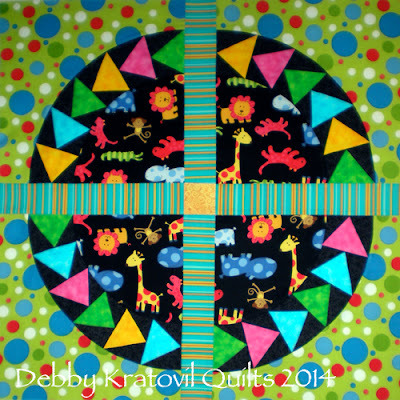 The center fabric is a large 10" finished patch so you can feature a beautiful large scale print. 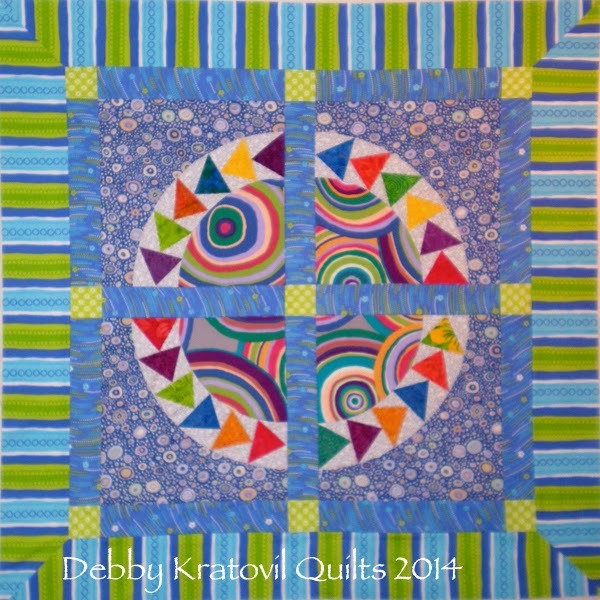 And the corners are paper pieced for a 14" finished block. 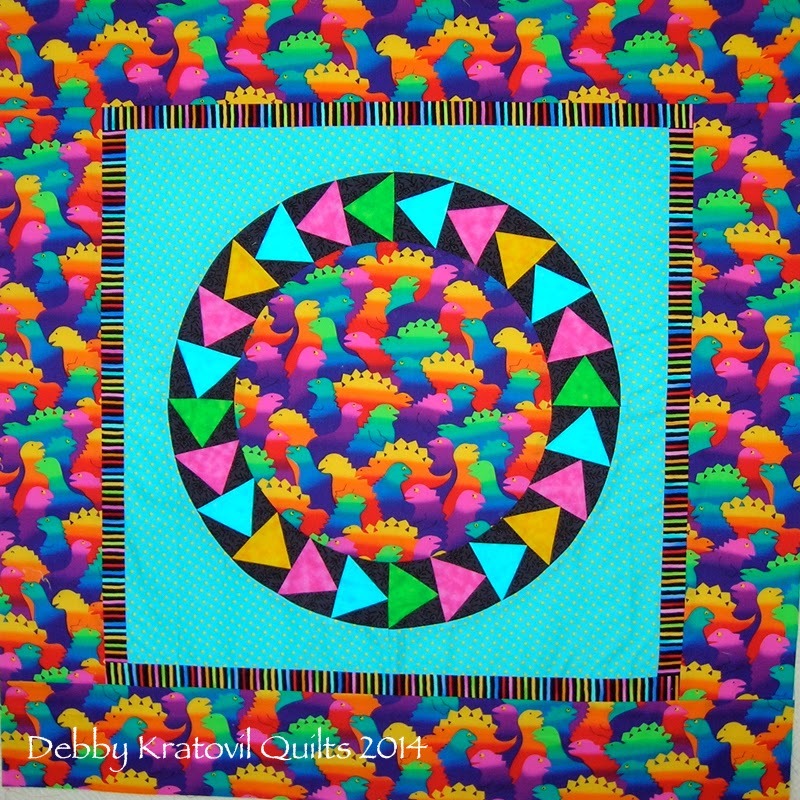 All rotary cut patches. 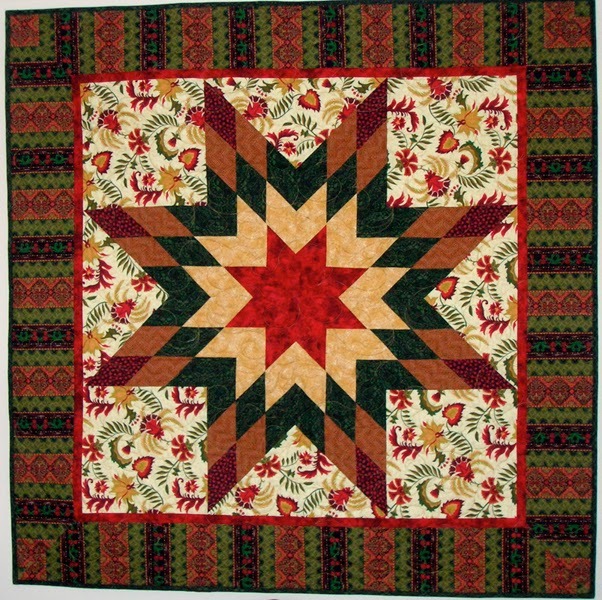 This was sewn in the hopes of having it "picked up" by a magazine a few years back. No one picked it up, so I took it on the road. 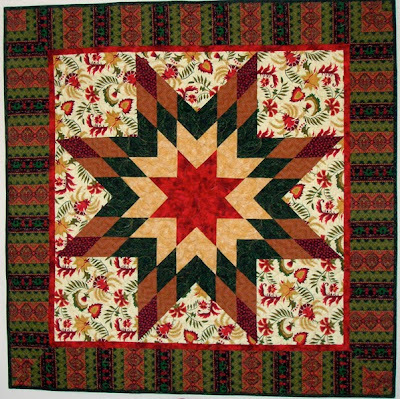 I love teaching this class because many students actually can finish most of the center star in a day. 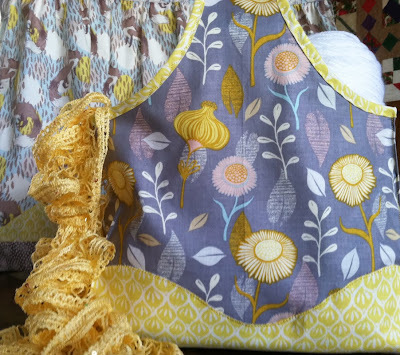 Don't you just love that awesome floral print I used for the background? 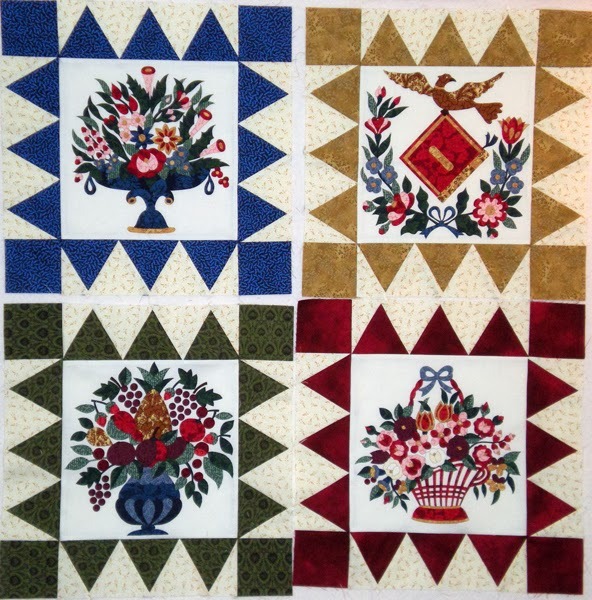 This was a collection from Blank Quilting called Holiday Splendor. 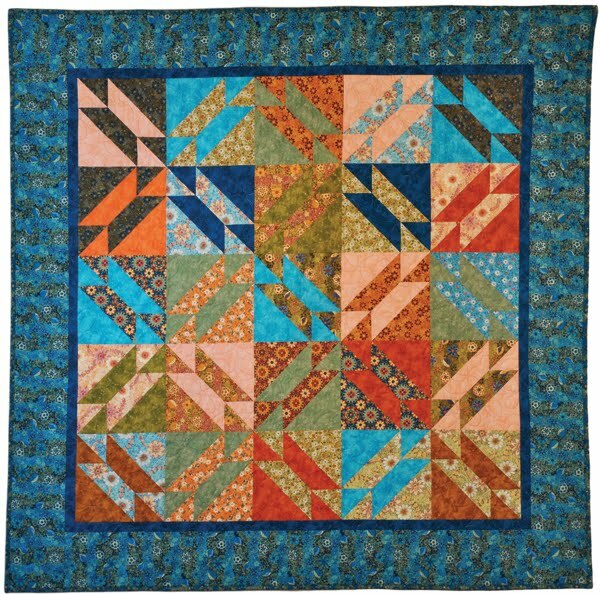 I had some leftover fabrics and used them to create my Magic Triangles quilt. 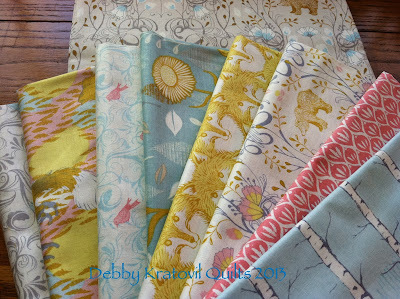 I absolutely love this fabric collection. I have another project I'm working on using the leftovers of the leftovers! I wish you and your family and friends a wonderful holiday, Merry Christmas and Happy, Prosperous New Year filled with good health and laughter. And, oh yes! 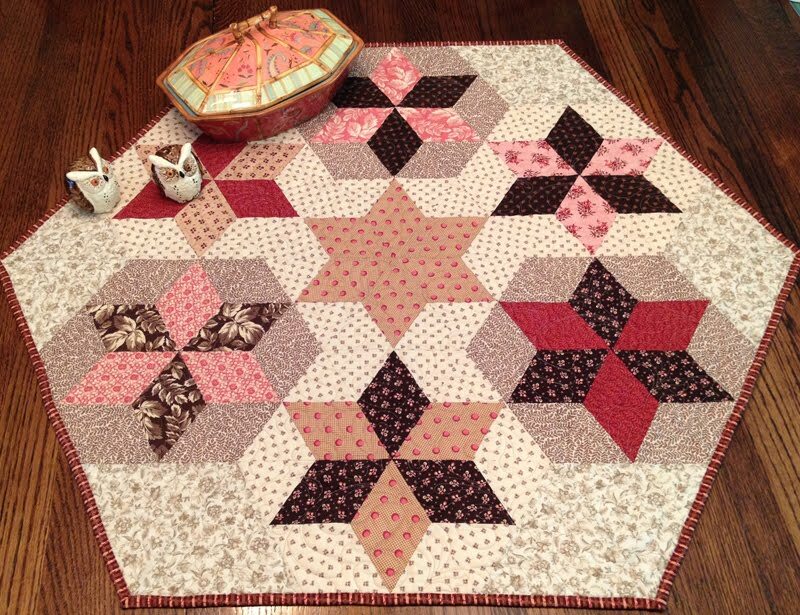 A lot of good quilting time. Anyone who knows me knows that I do NOT hand applique, so when I found a pile of Baltimore Album blocks for sale I immediately grabbed them. 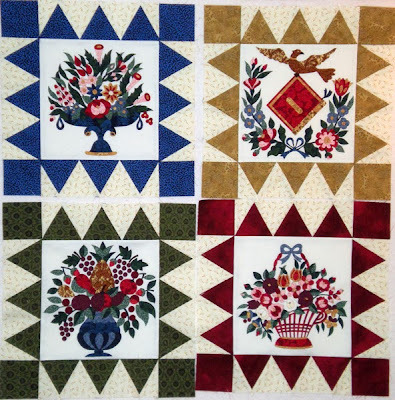 Did I say they were NOT hand appliqued? Oh, sorry about that. 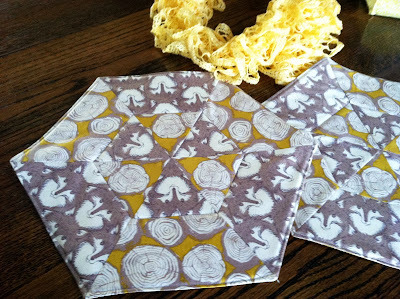 These are printed panels that only replicate beautiful, traditional blocks and boy did I have fun with them! I pulled colors from the panels: green, blue, mustard, deep crimson and cream. 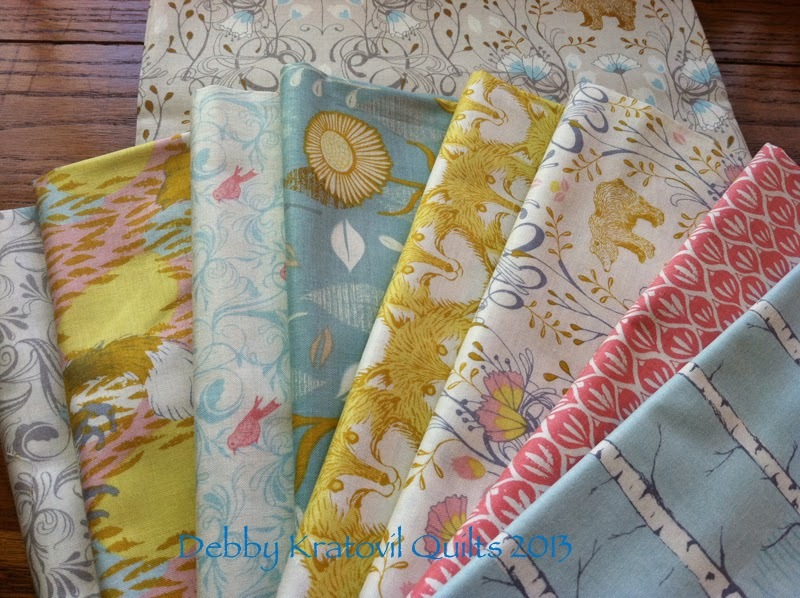 I searched my stash and found perfect fabrics to make Dogtooth triangles. 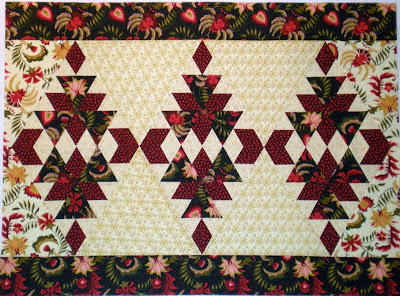 These were tricky as the panel size could not be divided evenly into thirds. 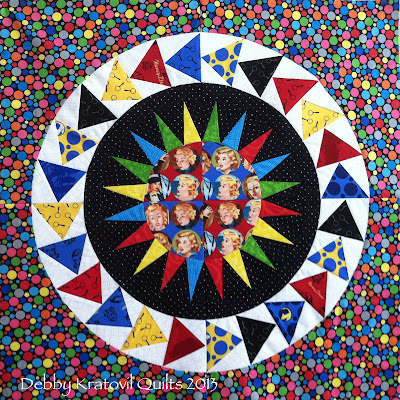 I fudged it - so don't look closely at the triangle points as they touch the panel - I lopped off points. But hey - I'm not into perfect, are you? A lovely wreath, book and bird. Have you ever seen a bird with a book in real life? Stop looking at the lopped off points! 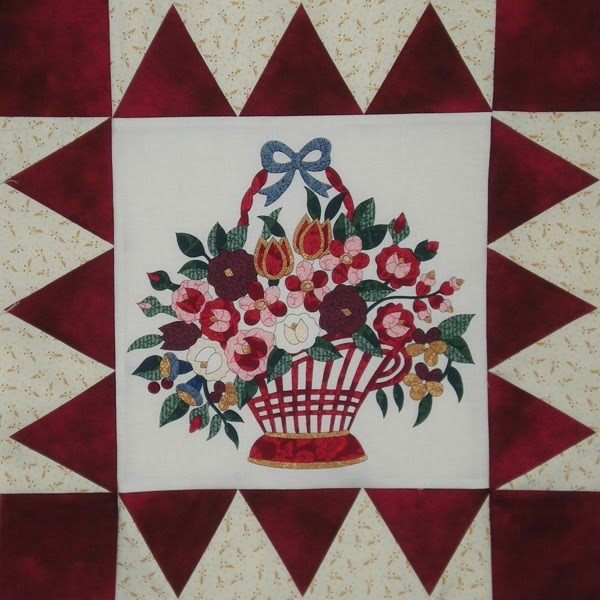 Look at the beautiful urn of flowers! And how will they look together? This is as far as I've gotten. I have about a dozen panels. I've pieced the triangles and will continue to play with these. I've been working on them for about 2 years. I'm never in a hurry. Do you think people making Baltimore Album blocks finish theirs in 2 years? I think not! 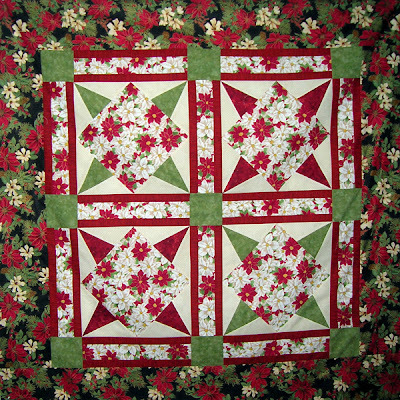 I will use a thin 1" strip between the blocks to "float" the cream and to avoid having all those points come together. 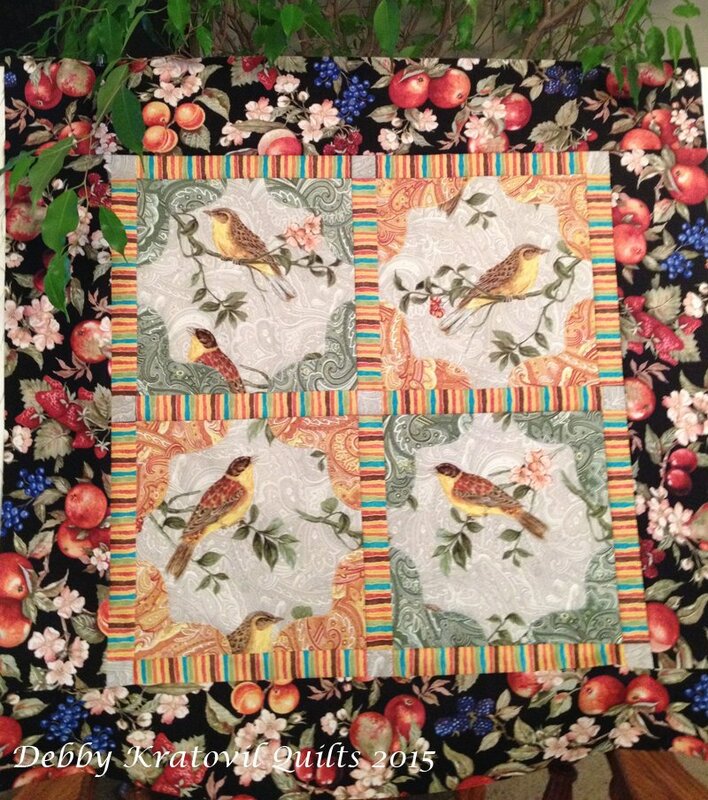 I hope you enjoyed my cheater's Baltimore Album quilt progress. I think I will pull the box out today and play a little more. 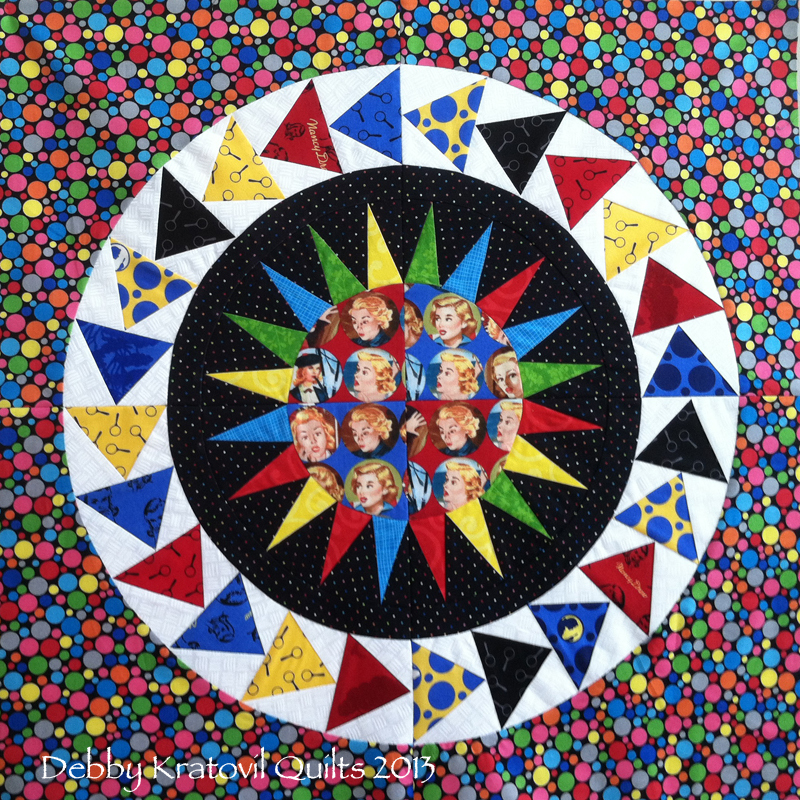 Quilt Calendars - The Perfect Holiday Gift! 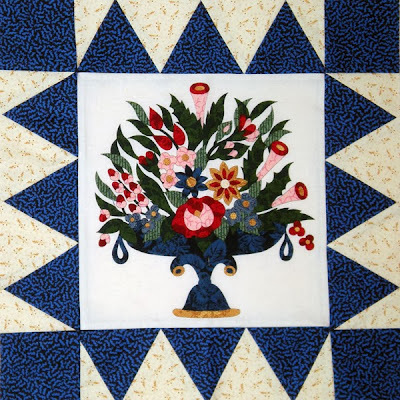 Martingale is my book and calendar publisher and they feature 5 wonderful quilting calendars that will be sure to please any discriminating quilter. 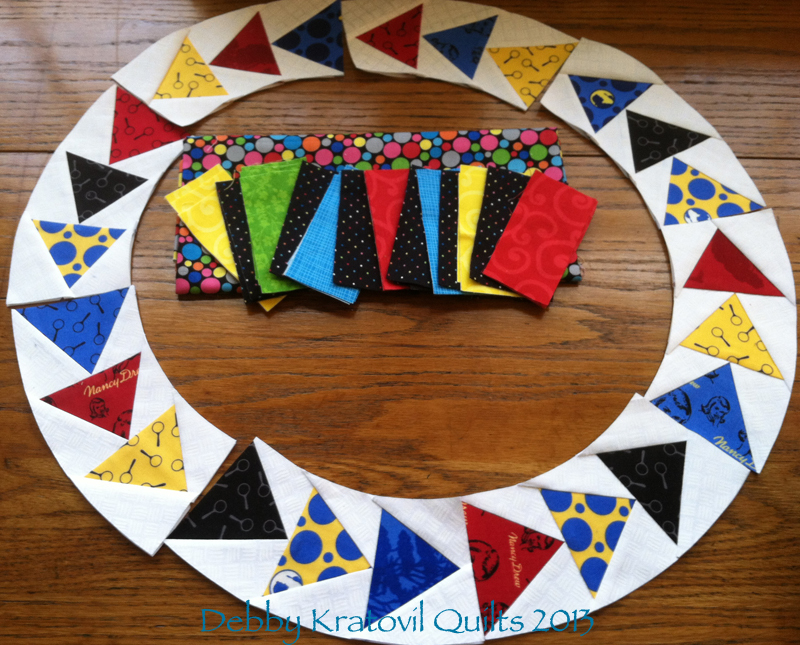 One of them is my own perpetual Quilter's Block a Day Calendar (both desktop and on CD). 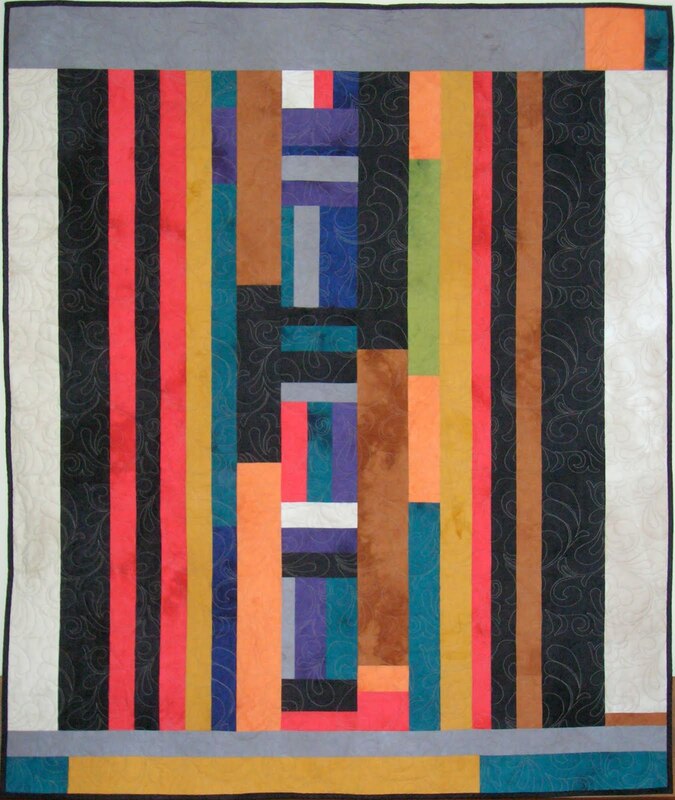 There are 3 wall calendars of quilts and two desktop calendars of blocks (mine and Judy Hopkins). You can see mine here. 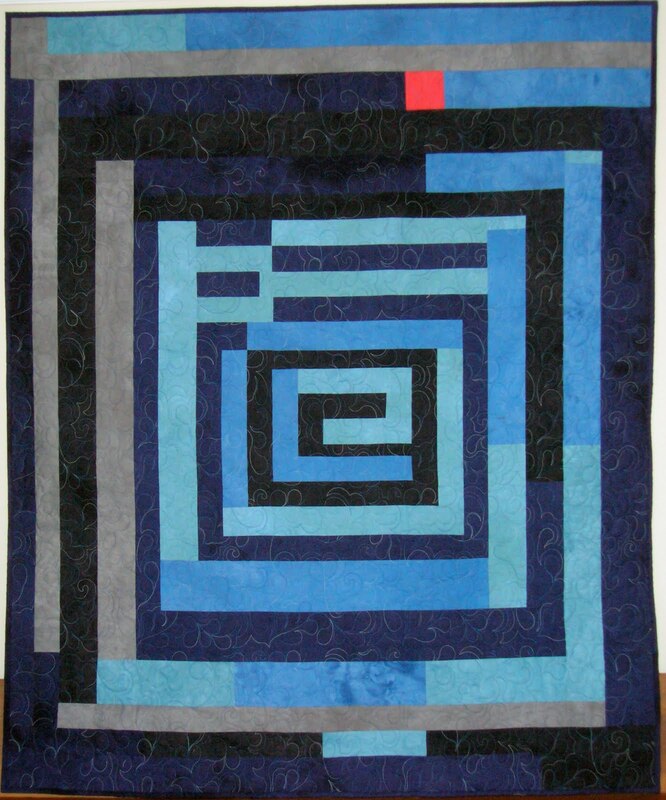 You can also see ALL THE BLOCKS as contained in the calendar by visiting my web site. Yes, you can see all 366 of the blocks and their size (you just don't have access to the cutting instructions). This way you can decide for yourself if it's a value (which I think it is, btw). Well-known author Debby Kratovil has been an avid block-pattern designer and collector for many years. 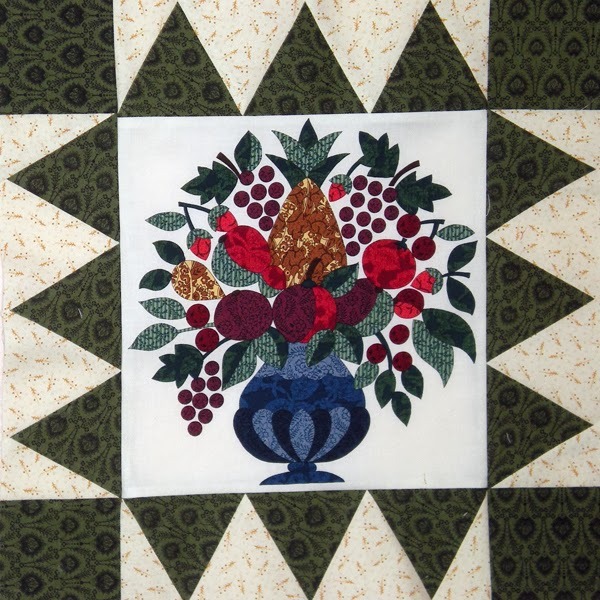 Her perpetual calendar includes 366 pieced and appliquéd block patterns that spotlight traditional, pictorial, seasonal, and holiday themes. The pages are listed only by day of the month, not by day of the week, which means it can be used year after year! 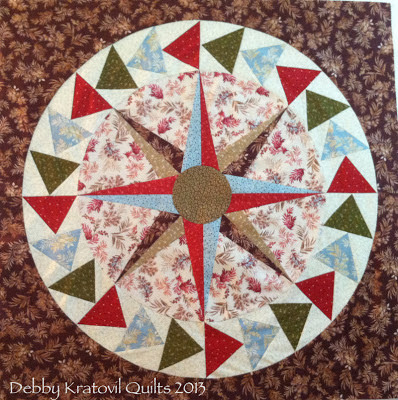 The Quilter’s Block-a-Day Calendar Companion CD allows quilters to easily print each block from the calendar in two different sizes. 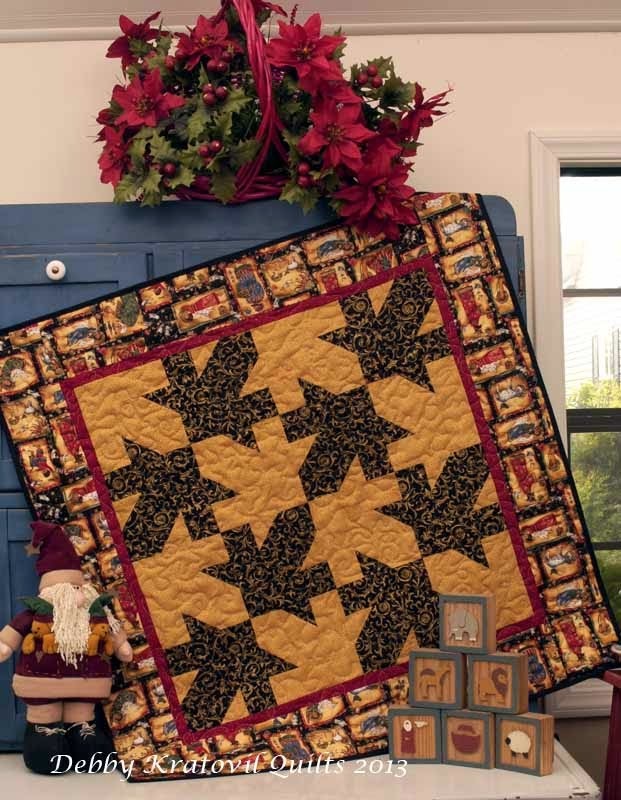 The CD also contains 12 complete step-by-step quilt patterns.Want to see the astounding range of designs in the Quilter’s Block-a-Day Calendar for yourself? Debby has compiled illustrations of all the blocks from her calendar on her website. Visit Quilter by Design to see them all before you decide who on your list will get this gift that keeps on giving! Gift list checked! 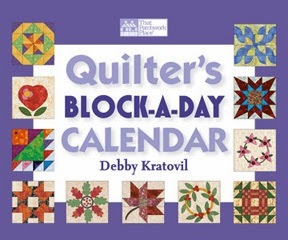 Order the Quilter’s Block-a-Day Calendar and the Quilter’s Block-a-Day Calendar Companion CD now. 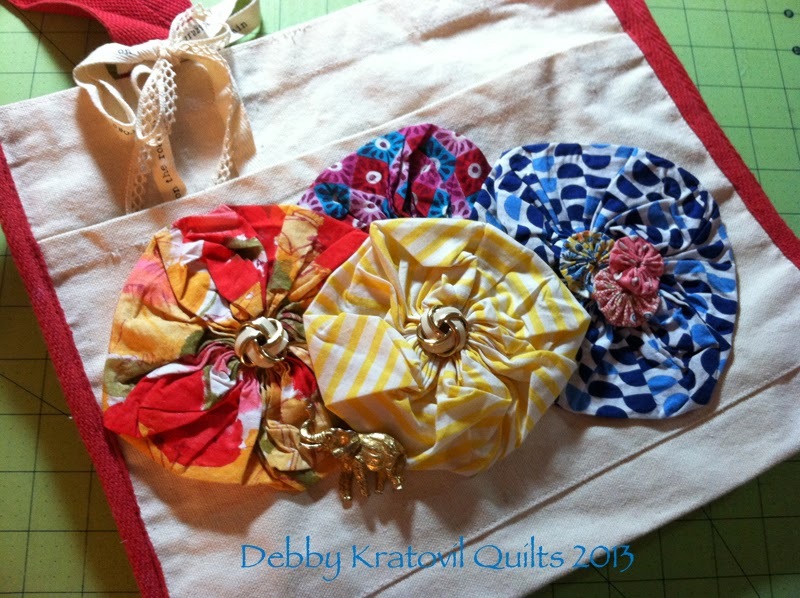 You can order these from Martingale, find them at your local quilt shop, or even order the companion CD from me. I don't sell the desktop calendar. 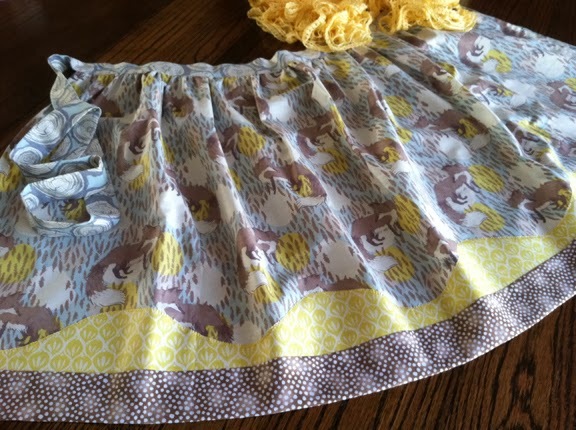 She Came; She Sewed . . .
An apron for Audrey from the fox fabric, which she loves! My "go to" pattern for a flanged pillow. Added a simple bow. 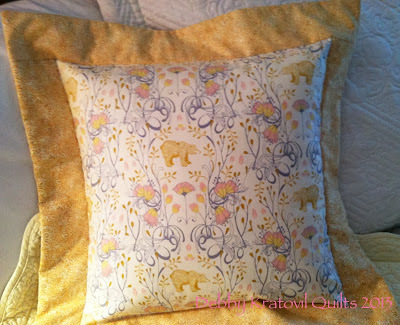 We chose a soft gold for the flange so the bears would pop! Her sister in law, Marga, was visiting from Mexico (she lives there with her husband; they're both Spaniards) and she sat and decorated a pre-made shopping bag. I have this huge bag of giant yo-yos from a yard sale that she chose from. Leftover clip earrings from my mother in laws jewelry box. We had a marathon day but quite fun. 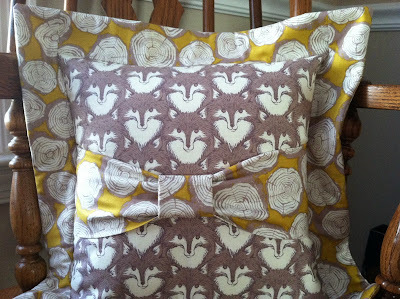 It's always a good day when I can sew. And Audrey loved everything we made, of course!